Lamborghini recalls 1,150 cars that can erase the trouble codes when drivers shut off the cars. December 4, 2018 — A Lamborghini Gallardo recall has been issued for more than 1,150 model year 2011-2014 Gallardo Coupe and Gallardo Spyder vehicles because of software problems related to trouble codes. The automaker says the engine control unit software may erase trouble codes after the ignition is turned off, something that will cause failures of the warning lights if safety system problems occur. 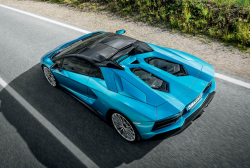 Lamborghini started receiving complaints in 2017 about cars that failed to pass smog tests, with some owners complaining the warning messages suddenly disappeared. An investigation showed errors in a software reflash procedure were causing failures of the trouble codes to store in the memory each time the vehicles were turned off and restarted. Dealers will reflash the engine software using the correct procedures once the recall begins December 14, 2018. Affected Gallardo Coupe and Gallardo Spyder customers may call Lamborghini at 866-681-6276 and refer to recall number L61XR0118. CarComplaints.com has complaints about Lamborghini cars.